Precision planetary gearheads are frequently used in conjunction with such servo motors in order to: balance inertial loading conditions seen during frequent speed cycling sequences, decrease the motor speed, boost the torque, and at the same time, provide a robust mechanical interface for pulleys, cams, drums, and other mechanical transmission components. Actually the servo-motor and gearbox combination became one of the basic “mechatronic” assemblies. This article shall present a foundation and a fundamental approach for understanding why the planetary system is the preferred design choice for servo gearheads; clear up some misconceptions about planetary servo gearheads; compare rating practices by establishing a transparent comparability of different torque listings; as well as introduce a simple and reliable analytic method of determining the required gearbox torque rating for a selected servo motor/gearbox application. • Sizing/selection of servo gearheads for matching AC servo motors in automation applications. 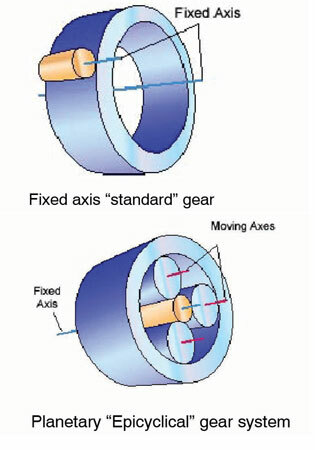 Frequent misconceptions regarding planetary gears systems involve backlash: Planetary systems are used for servo gearheads because of their inherent low backlash; low backlash is the main characteristic requirement for a servo gearboxes; backlash is a measure of the precision of the planetary gearbox. 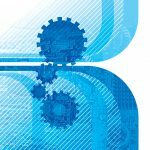 The fact is, fixed-axis, standard, “spur” gear arrangement systems can be designed and built just as easily for low backlash requirements. Furthermore, low backlash is not an absolute requirement for servo-based automation applications. A moderately low backlash is advisable (in applications with very high start/stop, forward/reverse cycles) to avoid internal shock loads in the gear mesh. That said, with today’s high-resolution motor—feedback devices and associated motion controllers it is easy to compensate for backlash anytime there is a change in the rotation or torque-load direction. 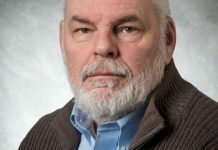 If, for the moment, we discount backlash, then what are the reasons for selecting a more expensive, seemingly more complex planetary systems for servo gearheads? 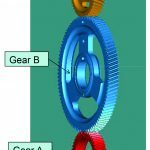 What advantages do planetary gears offer? An important requirement for automation applications is high torque capability in a compact and light package. This high torque density requirement (a high torque/volume or torque/weight ratio) is important for automation applications with changing high dynamic loads in order to avoid additional system inertia. Depending upon the number of planets, planetary systems distribute the transferred torque through multiple gear mesh points. This means a planetary gear with say three planets can transfer three times the torque of a similar sized fixed axis “standard” spur gear system (see Figure 1). 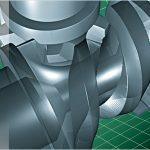 High rotational (torsional) stiffness, or minimized elastic windup, is important for applications with elevated positioning accuracy and repeatability requirements; especially under fluctuating loading conditions. The load distribution unto multiple gear mesh points means that the load is supported by N contacts (where N = number of planet gears) hence increasing the torsional stiffness of the gearbox by factor N. This means it considerably lowers the lost motion compared to a similar size standard gearbox; and this is what is desired. Added inertia results in an additional torque/energy requirement for both acceleration and deceleration. The smaller gears in planetary system result in lower inertia. Compared to a same torque rating standard gearbox, it is a fair approximation to say that the planetary gearbox inertia is smaller by the square of the number of planets. Again, this advantage is rooted in the distribution or “branching” of the load into multiple gear mesh locations. Modern servomotors run at high rpm’s, hence a servo gearbox must be able to operate in a reliable manner at high input speeds. For servomotors, 3,000 rpm is practically the standard, and in fact speeds are constantly increasing in order to optimize, increasingly complex application requirements. Servomotors running at speeds in excess of 10,000 rpm are not unusual. From a rating point of view, with increased speed the power density of the motor increases proportionally without any real size increase of the motor or electronic drive. Thus, the amp rating stays about the same while only the voltage must be increased. 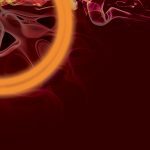 An important factor is in regards to the lubrication at high operating speeds. Fixed axis spur gears will exhibit lubrication “starvation” and quickly fail if running at high speeds because the lubricant is slung away. 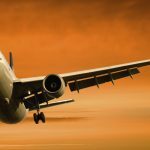 Only special means such as expensive pressurized forced lubrication systems can solve this problem. 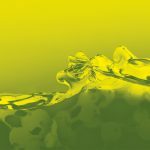 Grease lubrication is impractical because of its “tunneling effect,” in which the grease, over time, is pushed away and cannot flow back into the mesh. In planetary systems the lubricant cannot escape. 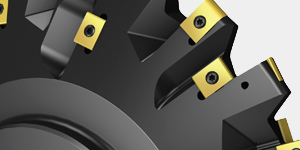 It is continuously redistributed, “pushed and pulled” or “mixed” into the gear contacts, ensuring safe lubrication practically in any mounting position and at any speed. Furthermore, planetary gearboxes can be grease lubricated. This feature is inherent in planetary gearing because of the relative motion between the different gears making up the arrangement. For easier computation, it is preferred that the planetary gearbox ratio is an exact integer (3, 4, 6…). Since we are so used to the decimal system, we tend to use 10:1 even though this has no practical advantage for the computer/servo/motion controller. Actually, as we will see, 10:1 or higher ratios are the weakest, using the least “balanced” size gears, and hence have the lowest torque rating. 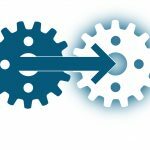 This article addresses simple planetary gear arrangements, meaning all gears are engaging in the same plane. The vast majority of the epicyclical gears used in servo applications are of this simple planetary design. Figure 2a illustrates a cross-section of such a planetary gear arrangement with its central sun gear, multiple planets (3), and the ring gear. The definition of the ratio of a planetary gearbox shown in the figure is obtained directly from the unique kinematics of the system. It is obvious that a 2:1 ratio is not possible in a simple planetary gear system, since to satisfy the previous equation for a ratio of 2:1, the sun gear would need to have the same diameter as the ring gear. Figure 2b shows the sun gear size for different ratios. With increased ratio the sun gear diameter (size) is decreasing. 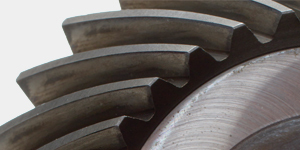 Since gear size affects loadability, the ratio is a strong and direct influence to the torque rating. Figure 3a shows the gears in a 3:1, 4:1, and 10:1 simple system. At 3:1 ratio, the sun gear is large and the planets are small. The planets are becoming “thin walled”, limiting the space for the planet bearings and carrier pins, hence limiting the loadability. The 4:1 ratio is a well-balanced ratio, with sun and planets having the same size. 5:1 and 6:1 ratios still yield fairly good balanced gear sizes between planets and sun. With higher ratios approaching 10:1, the small sun gear becomes a strong limiting factor for the transferable torque. Simple planetary designs with 10:1 ratios have very small sun gears, which sharply limits torque rating. Adding more planets can increase the torque density of the arrangement. To this effect we see that with lower ratios additional planet gears can be used; but for higher ratios, such as 10:1, multiple gears beyond, say, three planets, would cause interference. This is illustrated in Figure 3b. Positioning accuracy is a measure of how exact a desired position is reached. In a closed loop system the prime determining/influencing factors of the positioning accuracy are the accuracy and resolution of the feedback device and where the position is measured. If the position is measured at the final output of the actuator, the influence of the mechanical components can be practically eliminated. 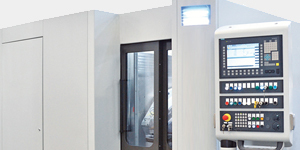 (Direct position measurement is used mainly in very high precision applications such as machine tools). In applications with a lower positioning accuracy requirement, the feedback signal is generated by a feedback devise (resolver, encoder) in the motor. In this case auxiliary mechanical components attached to the motor such as a gearbox, couplings, pulleys, belts, etc. will influence the positioning accuracy. Gearbox Stiffness/Elasticity: The elastic deformation or the “wind-up” of the components under load can significantly affect the positioning accuracy; and the positioning error is load-dependent since the wind-up, of course, depends on the load. Backlash: The clearance between mechanical components (such as the backlash of a gearbox) can contribute to the positioning error if the sense of the rotation or torque is changed during the positioning move. 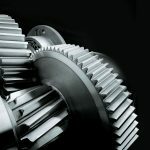 The overall rotational backlash of a gearbox is determined not only by the clearance between the gear teeth in mesh, it is influenced also by the other components of the gearbox such as the housing, bearings, shafts, and shaft/hub connection to name a few. Transmission Error: TE can be also described as “the fluctuation of the theoretical reduction ratio.” The output does not follow the input rotation exactly at the theoretical reduction ratio but fluctuates (+/-) a certain angle during the rotation, due to the inconsistencies of the gears (gear errors). These include pitch, lead, profile error, general eccentricity due to non-optimum positioning/placement, and others. The TE of a gear is directly dependent to the gear precision or gear class of the particular gear in question. And, just like the backlash, the overall gearbox TE is influenced by the other components of the gearbox. 1. What is the worst-case positioning error from the TE? 2. What is the worst-case positioning error due to the backlash in a motion cycle with motion direction reversal at rated torque load? 3. What is the worst-case positioning error due to the Stiffness or “wind-up” in a motion cycle with motion direction reversal at nominal torque load? Obviously the stiffness has the most significant influence. Gear Precision Class: A number of geometrical measurements and associated tolerances and deviations for these determine gear precision class. 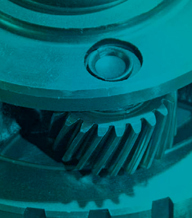 Various national and international organizations have established standards that define various gear precision class levels; these include AGMA, ISO, DIN, JIS, and others. It is a frequent misconception that the low backlash is a prerequisite for high precision. The fact is that the gear precision class has little to no influence on the backlash. On the other hand it has a determining influence on the TE as indicated in the previous example. Also, as shown, the stiffness can have considerably higher influence on the positioning error as opposed to either the backlash or the TE, again shown in the previous example. Repeatability: A measure of how exact a certain position is reached when a positioning motion cycle is repeated a number of times. Influence of the Gearbox Stiffness: If the repeated motion cycle is performed with different loads the stiffness of the system has a significant influence on the repeatability. Influence of the Gearbox Backlash: If the motion cycle is exactly repeated the backlash of the gearbox has theoretically NO influence on the repeatability; not even at fluctuating loads. 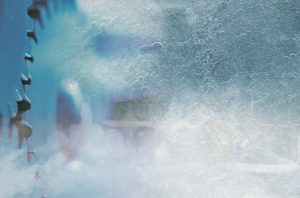 The basic limiting factor for electrical devices is the temperature; more specifically, the instantaneous, or gradual breakdown of the insulation of the device due to temperature, ultimately resulting in a failure condition. Other than the strength of the magnets used in a particular motor design, or the currents, and demagnetization characteristics, the torque rating of an AC servo motor is mainly determined by its “thermal loadability.” In a motor the generated heat is proportional to R x I2 x t and the rating limitation is the RMS value of the current (I) and its duration (t). Therefore RMS Torque is proportional to the current. On the other hand, the basic limiting factors of mechanical devices are the mechanical stresses, tension, compression, bending, shear, and Hertzian Pressure. The thermal loading is secondary, in for of possible lubrication film brake down. In virtually all automation applications, frequently changing loads multiple starts/stops and accelerations/decelerations are very common. Even if the external loads are constant, all major components of a gearhead are subjected to cyclic mechanical stresses. For example, let’s calculate the number of peak load cycles being subjected to the sun gear in a moderate/low cycle automation application. In the case of a 5:1 ratio planetary gearbox, with 3 planets, driven at 3000 rpm input, 2 peak load cycles per minute of 1 sec duration, the sun gear teeth must withstand: 2.304 x 1,000,000 peak load cycles in 10 days 16 hours shift of operation. See Figure 4/Example 2. The stress cycle rates on the planetary gears are lower, but they are subjected to reverse bending which fatigues the material even more. Peak loads on each sun gear tooth every 10 days. Obviously the component must be designed to endure practically unlimited load cycles of that magnitude to have a reliable long service life. II. 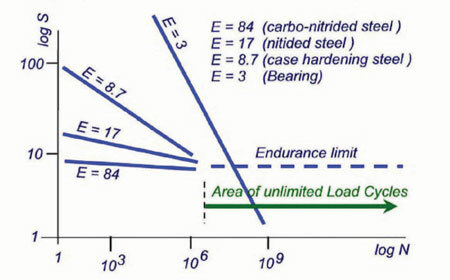 The “area of unlimited load cycles” – the horizontal portion of the S-N curve. 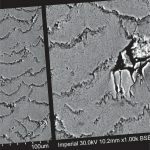 In the previous equations, “E” is an empirically determined factor that relates material properties, heat treat processes, and type of loading. Graphically it represents the slope of the line defining Area I. It should be expected for E to have a wide range of values since there is a wide range of materials being heat treated under various processes. Normally E=6 ~ 80. Note that if we plot on a logarithmic scale, E demonstrates a linear relationship (See Figure 6). The majority of real-world applications subject gear components to a significantly higher cycle loading than just 2 x 1,000,000 load cycles. 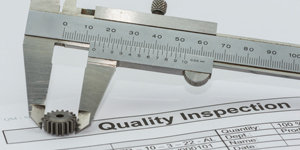 Therefore, the recommendation of practically all gear rating standards (AGMA, ISO, DIN, etc.) 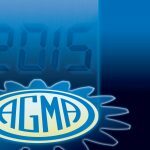 is to determine and list the torque rating of a gearbox based on the endurance limit of the gears, and on a certain minimum bearing life; for example for industrial gear boxes AGMA recommends 5,000–10,000 hours. Also note, in planetary gearboxes the planet gear bearing (i.e. the bearing supporting the plant gears and transferring the torque to the carrier) is constantly involved in the generation/transmission of torque; unlike the fixed axis gears, where all bearings only have a supporting function, of the “gear shafts”, they are not “actively” involved in the torque generation. The correct listed “rated torque” should be based on the endurance limit of the components, and a certain defined L10 design life at a listed rpm; i.e. a value at which the gearbox can run the L10 hours it is designed for at the listed torque subjected continuously, this is the continuous duty rating. For rotating electrical machines (such as motors, generators) IEC developed 10 characteristic Duty Cycles (S1 to S10) to, make the ratings more transparent, “standardized”. Duty cycle “S1” describes continues duty, the others, S2 to S10 are duty cycles with a wide range of changing load magnitudes, direction duration etc. As pointed out before, the electrical machines are thermally limited, they will not fatigued, they “recover” even after substantial large peak loads as long the RMS load and the associated heat up is not above a certain level. This is not the case for mechanical components/systems. Unfortunately, for various non-technical reasons, often times many servo gearhead manufacturers list ill-defined torque ratings, such “S5” duty rating, acceleration torque rating, etc. These values in most cases do not reference to the well-defined conditions, number of load cycles or hours of life. This makes a comparison difficult or impossible and the sizing / selection method speculative. 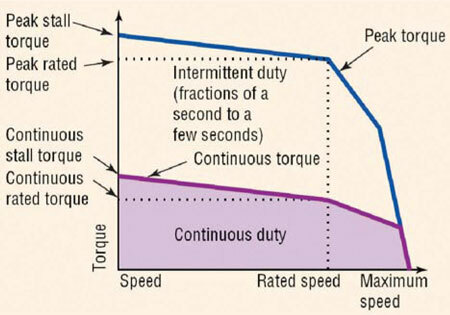 In some cases is possible to establish a comparison of these “artificial” torque ratings which are not based on the continuous duty, to the true rated torque, which based on the endurance limit and continuous duty, using a similar basic concept used in Miner’s rule and S-N curves. 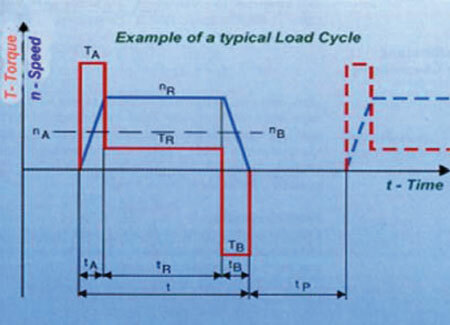 The fact remains that only in applications where the number of load cycles is below 2×106 are higher loads than the rated load permissible. 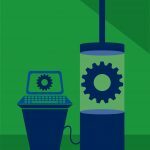 However, the majority of real world automation applications reach this number of load cycles in just a few days, weeks, or at best, after some months of operation. Therefore for a safe servo gearhead selection the rule must be: If the peak load cycle is part of the standard (designed) working duty cycle of the machinery, the peak load should not be higher than the rated torque unless the machinery is only working a very limited time (e.g. an hour a day) or if the user and OEM does not expect an extended maintenance-free life from the machinery. To predict the life in such applications, a detailed analysis of the load spectrum is required. The familiar and frequently used method based on the “Root Mean Cube” (RMC) torque value, is only applicable to the bearings and not the other vital components of the gearbox such as the gear teeth or shafts. A correct calculation requires the application of unique exponents, for the individual components, made of different materials, with different heat treatment, and loading conditions, as shown in Figure 6. Thus we desire to establish a torque rating based on a similar method/algorithm as that of Miner’s rule. Automation, motion control, and positioning applications are characterized by repeated acceleration and deceleration cycles associated with frequent starts/stops and direction reversals. 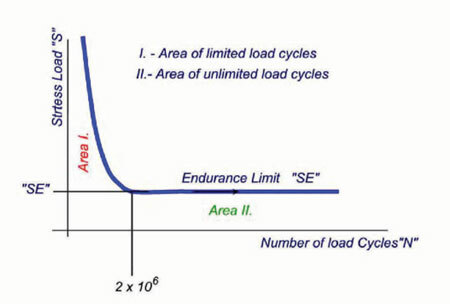 The characteristic load cycle of an application usually consists of a number of load peaks of different intensity and duration. The exact load cycle of a machine is not easy to predict; however, it can be measured and a statistically representative load characteristic cycle can be generated. In most cases, the exact load cycle is not known and the task is to size/select a gearbox for a given servomotor. With basic load related data, namely the load inertia, the magnitude of the maximum non-dynamic load (such as friction load), and the available motor data, a reliable and realistic estimation of the required gearbox torque rating is possible. For a given servomotor, the maximum dynamic (acceleration) peak torque is known from the motor data sheet. To assume that the gearbox is exposed to the maximum motor peak torque can easily lead to oversizing and associated cost increases. 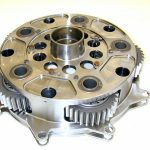 In the vast majority of real applications a substantial portion of the motor peak acceleration torque is not transmitted through the gearbox because a significant part of it is “consumed” in order to accelerate the motor rotor, i.e. only a part of the motor peak torque will “travel” through the gearbox. We shall now derive the general governing equation, which will allow us to determine the magnitude of the peak torque of a gearbox. 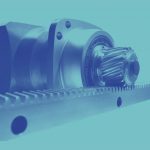 Knowing the magnitude of the peak torque traveling through the gearbox there is a straightforward method that can be used to easily select an appropriate gearbox size. Consider the system consisting of motor, gearbox and load, shown in Figure 7. All system parameters are reflected to the motor axis i.e. “JLR = JL/i2” and TLR = TLd /i with “i” being the reduction Ratio, JL the load inertia at the output, and TL the true torque at the output. The TLR load torque is the friction torque and/or a gravity-born torque present in the system under steady state condition as well as during the acceleration phases of the motion cycle. TL represents the non-inertial resistance forces the drive has to overcome. This is an easy-to-use formula, one that is valid for all motor inertial and frictional torque combinations. To have a long, maintenance-free gearbox life, the calculated gearbox load “TGR x i” should be equal to or less than the gearbox torque rating. The inertia parameter defined previously, k=JM/(JLR + JM), is closely related to the Inertia Match Ratio which is Load Inertia/Motor Inertia, IMR = JLR/JM. Figure 8 With some substitutions above we have: k = 1/(IMR+1). With the IMR being a widely-used basic characteristic of a servo-driven system, it shows how well the system is balanced from the control as well as the overall economic point of view. Systems with “balanced” inertias, meaning IMR of approximately ≈ 1:1, have good responsive control characteristics. This means, in a system with 1:1 inertia ratio, 50% of the motor peak torque will be “consumed” or expended to accelerate the motor rotor and only the other 50% of it will “travel through” the gearbox to accelerate the load. Using the previous equation, an appropriate gearbox can be selected based on this calculated maximum output torque requirement of “TGR x i” instead of selecting one based on the full peak motor torque, i.e. based on “TM x i”. Based on the proposed method developed here, one can visualize the torque through the gearhead in terms of percent of the motor peak torque. In Figure 9 the torque through the gearbox is depicted as a function of IMR (Inertia Match Ratio). The non-dynamic torques such as friction torque, again, relative to the motor peak torque, is used as a parameter. 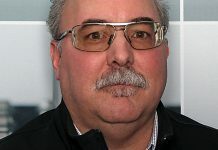 The above, basically analytical method of determining the required torque rating, has only a good practical application if this torque is compared with the continuous duty “S1 rating” of the gearbox, not with some ill-defined rating such as the S5 duty based. The peak torque of the servo motor can be utilized only within very limited time parameters in the motion cycle, i.e. 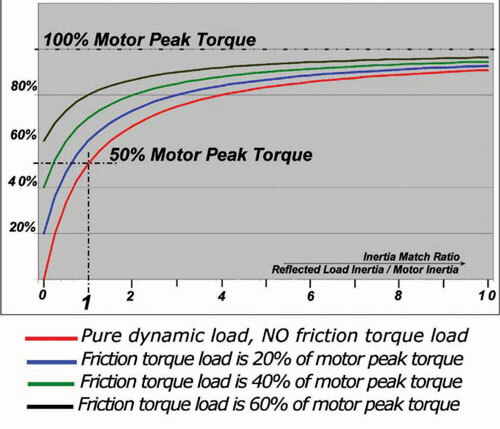 in high cycle rate applications, motor full peak torque is not available for a rapid sequence of accelerations/decelerations, and the available motor torque is considerably less than the peak torque, if not, the motor can burn out. For high cycle rate applications repeating many times in a minute or even multiple times in a second, it is necessary to have a low IMR close to, or even less than unity, IMR ≤ 1. On the other hand, low cycle rate applications certainly can utilize the peak torque since it does not occur with high frequency over the motion cycle, here we can have a larger inertial mismatch, which means high torques will be transmitted through the gearbox. 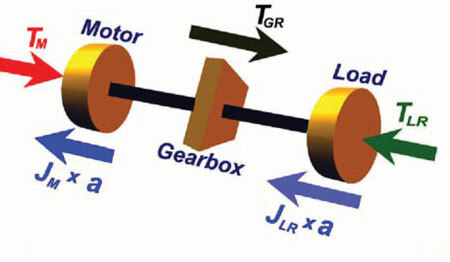 Furthermore, contrary to the common belief that high cyclic operations are tough on gearheads, high cyclic automation application, with matched inertias using the methods outlined in this paper, can utilize lower torque rating (smaller size) gearheads—compared to low cycle rate operation, with high inertial mismatch, where a gearbox with larger torque rating is needed. The described selection method is generally applicable and can be expanded for use with all gearboxes and gear motors as long as the gearbox torque rating is a “true rating” and the application does not have frequent external heavy shock loading, such as sudden jam or frequent emergency stops. This paper presented a general foundation for the further approach and understanding of planetary gearing and why such type of gearing system is the preferred design choice for servo gearheads. 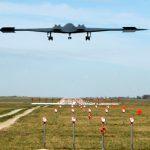 This was done within the context and discussion of torque density, rotational stiffness, inertia, speed, positioning accuracy, and other important factors and requirements in demanding applications such as automation, motion control and robotics. 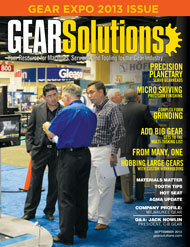 The paper also attempted to clear up some misconceptions about planetary servo gearheads; it laid the groundwork for rating method, by starting with a discussion of fatigue behavior, and the expansion of well known concepts into a rating method of a systems with cyclic dynamic loading, with the concept of inertial matching and balancing in order to optimize planetary gearhead/servo motor selection. It is the intention of the author to stimulate further research, thought, and open discussion on the potential use, further rating refinement, and general optimization of precision planetary servo gearheads in various demanding applications for which they are best suited. • Antony, Gerhard. “Getriebeauswahl durch realistische Abschatzung des Erforderlichen Betriebsfaktors”; SEW Eurodrive, 1989. • Herr, Thomas. “Planetary Servogears”; PT Design Planetary Gear Report, August 2000. • Kaim, Charles. “The World of Planetary Gears”; PT Design Planetary Gear Report, August 2000. • Predki, Wolfgang, et.al. “Load Distribution in Planetary Gears”; 4th World Congress on Gearing and Power Transmission, Paris, March 1999. • Townsend, Dennis (Editor in Chief). Dudley’s Gear Handbook, 2nd Edition, McGraw-Hill, Inc. 1991. **Printed with permission of the copyright holder, the American Gear Manufacturers Association, 1001 N. Fairfax Street, Suite 500, Alexandria, Virginia 22314. Statements presented in this paper are those of the authors and may not represent the position or opinion of the AMERICAN GEAR MANUFACTURERS ASSOCIATION. has 20 years experience in international manufacturing. 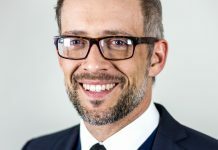 He is currently director of Engineering at Sumitomo Drive Technologies, a subsidiary of Sumitomo Heavy Industries, Japan. 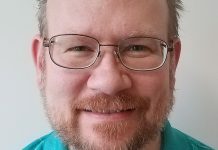 He holds a BS in Aerospace and an MS in Mechanical Engineering, both from Boston University in addition to a PhD in Engineering Management from The George Washington University.